I was riding recently with coach Donna riding behind and she gave me a tip about my pedal stroke. She suggested that I concentrate on one leg at a time and focus on pedalling in circles to make my pedal stroke smoother. So since then I’ve been practicing and have also done a bit of research on pedal stroke. I came across an article on one of my favourite women’s cycling websites – womenscycling.ca and asked permission to share it with you. The original article was written by Clair Cafaro…….. Focusing on a smooth, round stroke will actually help to produce more power per stroke. If you think about it, pushing and pulling connotes a linear trajectory, or at best pedalling a square. Instead, imagine the pedal stroke as a clock face. Imagine that your foot is on top of a barrel and you are rolling it forward allowing your foot to move across the top of the pedal stroke. Imagine your toes pushing towards the front of your shoe. Fully engage your core, begin to drop your heel, relax the belly but engage the core by bringing your ribs to meet the hips. This will fully engage the core and provide a strong platform for your legs to push up against. During the power phase many riders will rotate the pelvis forward as the knee is in the flexed position which results in a loss in power. It’s important to try to keep the hips square. Begin to drop heel in this phase. Begin this phase with the heel dropped. Drag the foot across the bottom of the stroke leading with the heel which engages the powerful muscles of the gluteus and hamstring group. It’s as if you’re scraping mud off your shoe. Imagine trying to lengthen the crank arm. Help with the power phase by floating the foot on the pedal. As you approach 10:00 imagine throwing the entire leg over the handlebars. 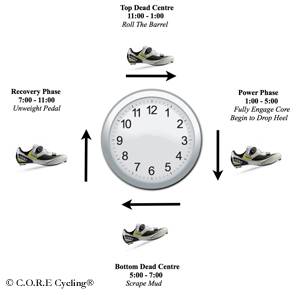 Practice the four phases on your trainer with a gear big enough to feel the entire stroke. If you have access to a power meter, try your old way of pedalling and then pedal full smooth circles (be sure to keep the cadence and gearing consistent with both efforts). You’ve now learned how to pedal efficiently through the “dead” spots at the top and bottom of the stroke, becoming more productive and powerful simply through a better understanding of the beautiful, simple pedal stroke.